Add this amazing recipe to your repertoire and impress your friends; great for a dinner party!!! This is very similar to the French version, bouillabaisse, only this doesn’t have saffron and the base is tomato. Staying true to Harris’ Italian roots was his goal when creating this dish. The star ingredient is the calamari! If you’ve not cooked calamari before now, don’t be afraid. Most fear cooking calamari any way other than breaded and deep-fried but fear not. You will be surprised how tender and flavorful it is in this dish. If you watch our video, you will also see how much liquid is released from the calamari as it simmers. While I do believe in substitutions, we strongly recommend not replacing the star ingredient; you’re going to love it!!! We recommend serving with garlic rubbed crostinis or a rustic bread as you’ll definitely want something to soak up the delicious broth while eating the shell fish! 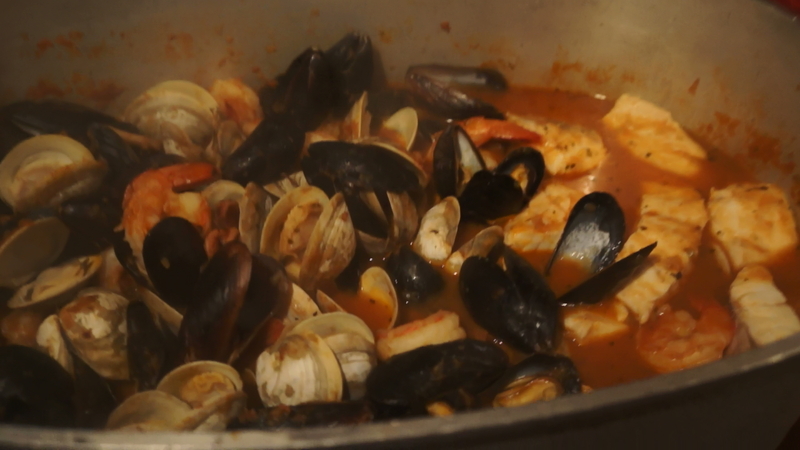 Here in the video, Harris demonstrates how to cook our very special Cioppino! See below for the recipe! The dish requires a very large Dutch oven or clam pot. Place fresh clams and mussels in a large bowl of very cold water with ice to flush out any sand in the shells. Before adding clams and mussels inspect to be certain all are tightly closed. If any of the shells are open or cracked, discard, as they are dead and not edible. Also trim beard of mussels if needed. Place Dutch oven over medium heat and add the olive oil. When oil is hot, add the fennel, onion, celery, oregano, and red pepper flakes. Season with Kosher salt to sweat the onions. Cook until translucent, about 15 minutes, stirring occasionally. Reduce heat to medium-low and add squid. Cook for another 15 minutes, stirring occasionally. The squid will release their juices, which is amazing and will become very tender. Raise heat to medium-high and add white wine. Cook until reduced, about 20 minutes. Reduced heat to low and add tomato and lemon strips and cook until very thick, about 45 minutes. Remove lemon strips, add salt and pepper to taste. Raise heat to medium-high, add water and clam juice and bring to boil. Add clams, mussels, and shrimp, cover and cook until most of the shells have opened, about 5 minutes. Add rock fish and cook another 2 minutes until the fish is opaque. In a small bowl, combine chopped parsley and grated lemon to make Gremolata. Serve in individual large bowls, placing seafood in the bottom of bowl, ladling over the seafood the broth. 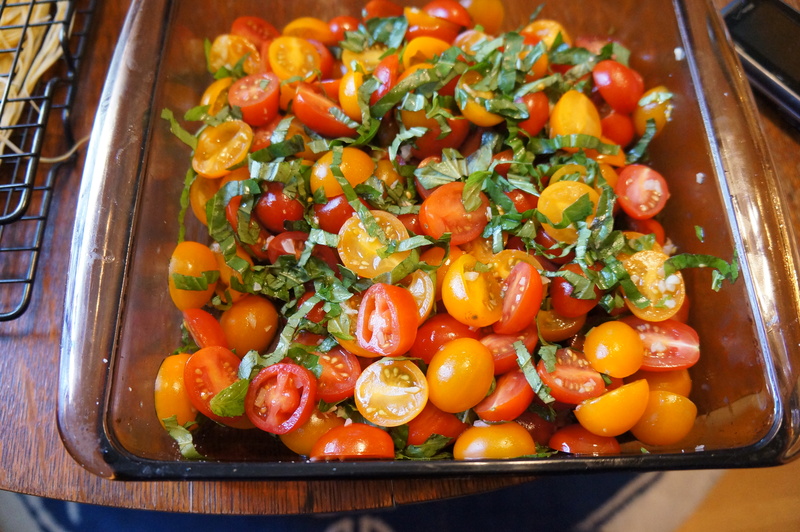 Sprinkle with the gremolata and serve. Knock your socks off Amazing Italian Seafood Stew! 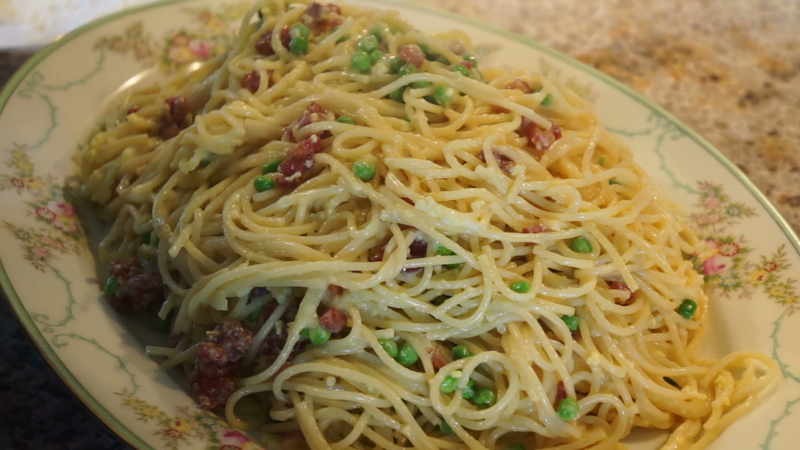 The Best Fresh Pasta: The Dads Tested- Italian Grandmother Approved! We just ventured into making our own pasta and did a lot of experimenting! 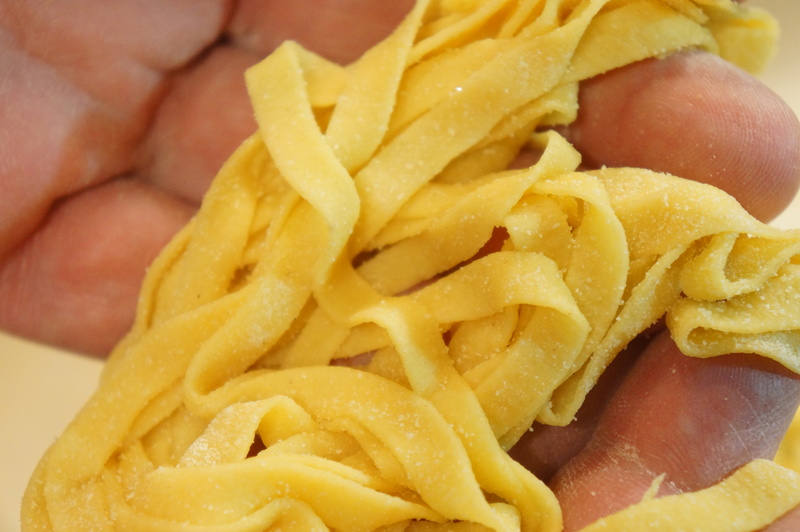 After trial and error, here’s the best fresh pasta recipe we found out there! Have you made pasta from scratch? Tips you would like to share? Send us an e-mail or leave a comment above! Enjoy! Mound the flour in the center of a large wooden cutting board or the center of your countertop. Make a well in the middle of the flour; sprinkle the salt over the flour. In a small bowl, lightly whisk your eggs and olive oil together and gently pour into the well (be careful not to let the egg mixture burst through the wall of your well). Using a fork, begin incorporating the flour starting with the inner rim of the well and working your way out. As you incorporate the eggs, keep pushing the flour up to retain the well shape so the eggs don’t escape. If they do, don’t worry – keep on going and it will still come together. As all the flour gets incorporated, you will have to begin using a kneading action with the palm of your hand as this will become a bit of a difficult mass to work. Parts of the mass will also become dry bits but just keep incorporating them. Now use both hands to knead the dough, primarily using the palms of your hands. Once the dough is a cohesive mass, remove the dough from the board/countertop and scrape up any leftover dry bits and discard them. Lightly flour the board, if necessary, to prevent sticking and continue kneading for another 5 to 6 minutes. Divide the dough into 4 equal pieces and wrap securely in plastic wrap and let rest for 30 minutes at room temperature. 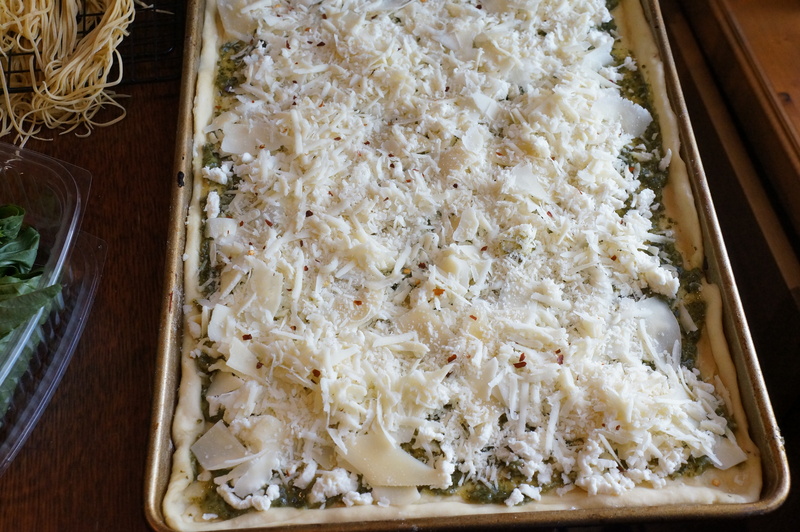 If you’re not planning to work the dough and cut into pasta at this time, you can refrigerate the dough overnight and cut the next day, but not any longer as it will turn dark in color. Next is the fun part and that’s cutting the pasta! If you have a machine, make certain to use the rolling press, starting with the largest opening and slowing stepping down to the smallest opening. Once fully kneaded by the machine, select the size cutter to use and begin rolling the dough through the cutter. We found it’s really helpful to have a second person working with you at this point as when you’re cutting the pasta it helps to have someone else holding and pulling it from the cutter as it cuts so as not to have it clump under the machine. Then, hang to dry on racks or cook fresh. 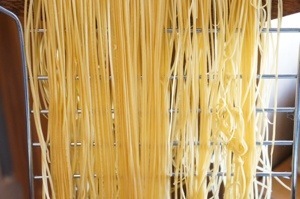 For a drying rack, we just used a rack from our oven turned vertical and hung the pasta over the rack. For the pasta that we were cooking right away, we just laid it out on baking sheets and cookie racks. 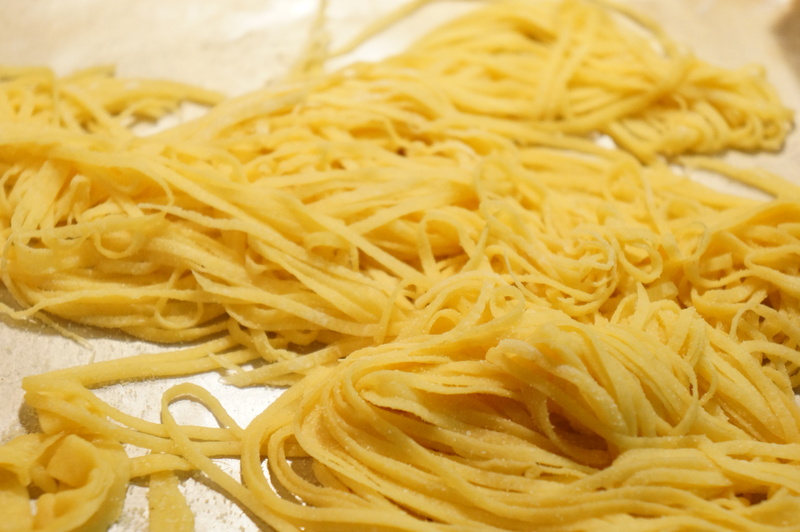 The above recipe makes approximately 1 pound of fresh pasta. Celebrating Harris’ Mother’s 87th Birthday- Italian Style! Mom’s birthday party turned out just a special as we anticipated. In our previous blog entry, Leah shared with you about how her Great-Grandparents were from Palermo, Italy. For our theme, we wanted to incorporate foods that Harris’ mother would have enjoyed growing up. Antipasti, or the starters, are very important in Sicilian cooking. We made two. We had some hot crab dip, a Maryland favorite, to celebrate my mother’s love of Ocean City. 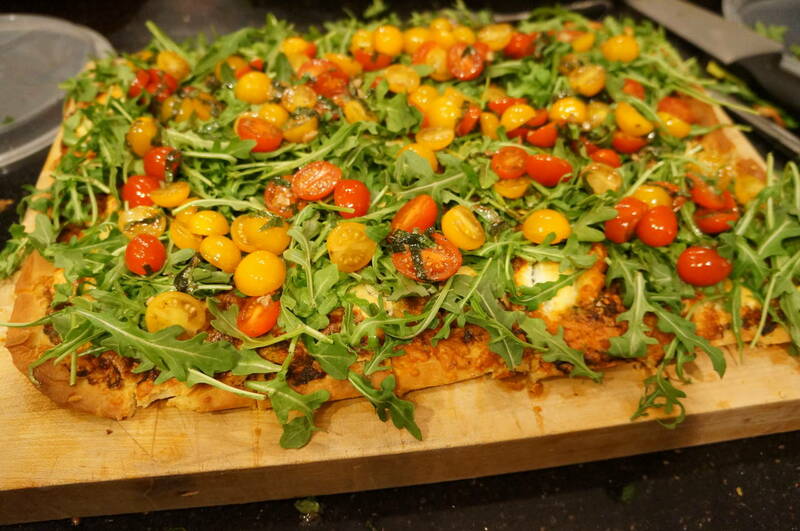 To celebrate her Italian heritage, we also made a fresh pesto and cheese pizza which was topped with arugula, basil, and cherry tomatoes. It was like a little slice of Italy! 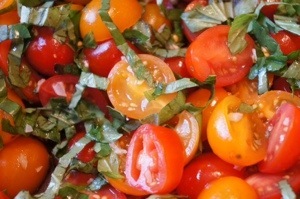 Below is a picture of the tomato mix before we dressed the pizza! Since saffron is such a staple in Sicilian cooking, we made a very light saffron soup that was packed with mussels. Our guests really seemed to enjoy it, especially with our homemade rosemary focaccia bread. The bread was delicious, but wow- that recipe is not for beginners! It took us about 2 days to make! 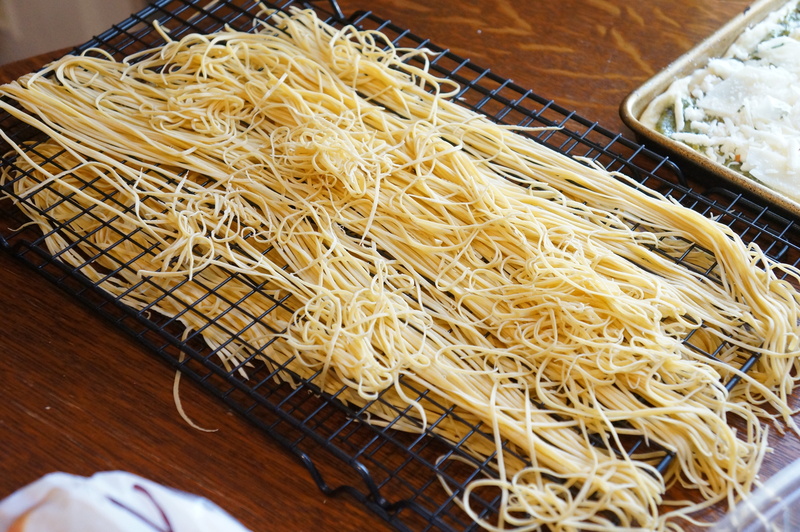 For our main course, we made Angel Hair pasta from scratch two ways. The first, was aglio e olio style – meaning with olive oil, fresh basil, and sundried tomatoes. The second was a red-sauce based pasta, which was pared with homemade meatballs. But these meatballs, mixed with beef, veal, pork, prosciutto, and parmesan cheese, were not for the faint of heart! We also made some hot Italian sausage and baby backed ribs, all cooked in Harris’ homemade tomato sauce. And although the food turned out great, the best part was that the family was together, and sharing stories from the past. It was very special. For dessert, we made the Decadent Chocolate Cake- check our recipes tab to try this one out yourselves! After dessert, we all joined around the piano for songs and stories. It was the perfect way to celebrate and we think Mary had a great time!